SOLD This 1950s basse-taille floral pin has simple lines and yet the design is forceful. 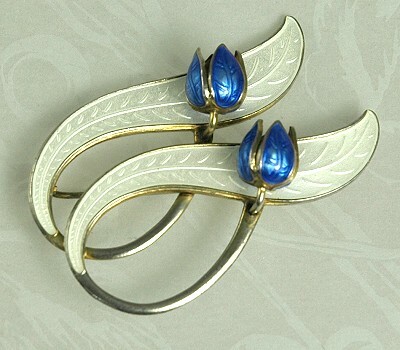 Blue enamel buds with white enamel leaves in vermeil over sterling from Aksel Holmsen, Sanderfjord, Norway. This pin in green and yellow can be seen in the book Warman's Jewelry, 3rd Addition by Christie Romero on page 241. The mark appears on the reverse. Condition: Excellent vintage. There is some wear to the vermeil, mostly on the reverse. The enamel looks great! Measurements: 2 1/4" long and 2" wide.